The Blood Horkers are a notorious group of pirates led by a powerful battlemage, Haldyn, who prowl the waters of the Sea of Ghosts, raiding alongside the northern coastline of Tamriel. The Civil War has given the pirates the opportunity to increase their attacks without fear of serious retaliation from either the Empire or Windhelm. 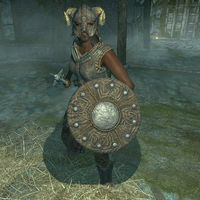 In fact, the only ships which sail the Sea of Ghosts unscathed are those owned by Clan Shatter-Shield, a "very powerful family in Windhelm," due to an agreement forged with Shatter-Shield gold between Blood Horker captain Stig Salt-Plank and Suvaris Atheron, the employee of the clan's patriarch, Torbjorn Shatter-Shield, and the overseer of their shipping operations. Through this agreement, the Shatter-Shields hold a monopoly on foreign shipping, as their competitors are dealt with by the pirates. Recently, the Blood Horkers have even been interfering in the operations of the powerful East Empire Company. The Blood Horkers "draw council" in their island fortress, Japhet's Folly, the location of which is kept secret through discretion and Haldyn's magic, which he uses to create fog to hide the island. The first five entries on this page are encountered in Japhet's Folly while the last two are part of the random encounter. These two Blood Horkers are bandit wizards. They each wear fur armor with a pair of leveled light boots (up to scaled quality). They each carry a leveled dagger (up to daedric in quality), a lockpick, and 25-125 gold, dependent on their level. These four Blood Horkers are members of the bandit class. They each wear a set of leveled light armor, including boots and bracers (up to scaled in quality). They each carry a leveled weapon (up to elven in quality) and 25-125 gold, dependent on their level. These two Blood Horkers are members of the bandit class. They each wear a set of leveled light armor, including boots and bracers (up to scaled in quality). They each carry a leveled two-handed weapon (up to elven in quality) and up to 25-125 gold, dependent on their level. These two Blood Horkers are bandit archers. They each wear a set of leveled light armor, including boots and bracers (up to scaled in quality). They each carry a steel dagger, a lockpick, a leveled bow with 20 leveled arrows (both up to elven in quality), and 25-125 gold, dependent on their level. Redguard Blood Horker in heavy armor. This Blood Horker is a member of the bandit class. They a set of leveled heavy armor, including the boots, gauntlets, and helmet (all up to steel plate in quality). They carry a leveled one-handed weapon (up to elven in quality) with a leveled shield (up to steel in quality) and up to 25-125 gold, dependent on their level. 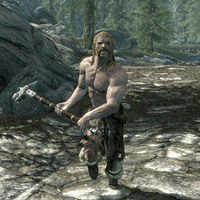 This Blood Horker is a Nord member of the bandit class. He wears a set of leveled light armor, including boots and bracers (up to scaled in quality). 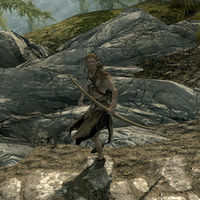 He carries a leveled two-handed weapon (up to elven in quality) and 25-125 gold, dependent on his level. He is randomly encountered after completing Rise in the East. He hunts you down to seek revenge on you for your actions during the quest. This Blood Horker is a Nord bandit archer. He wears a set of leveled light armor, including boots and bracers (up to scaled in quality). He carries a steel dagger, a lockpick, a leveled bow with 20 leveled arrows (both up to elven in quality, and 25-125 gold, dependent on his level. This page was last modified on 25 January 2019, at 22:57.